The tour will start at the heart of Moscow – on Red Square, which is home to some of the most remarkable and spectacular places of interest in the city. You will then enjoy the breathtaking view of Moscow from the viewpoint of the recently renovated department store and walk in the old districts of Moscow, packed with significant historic buildings, dating back to 18th – 19th centuries. As you will make your way from one of the striking examples of architecture of Stalin era to the building, symbolizing modern-day interpretation of this style, you will hear a dramatic story of buildings demolished during that period. The surrounding area boasts of plenty of different restaurants where you can have your lunch – the choice is yours! The tour will end at VDNKh – All-Russia Exhibition Centre, well known for its «Friendship of Nations» Fountain placed there in Soviet times. 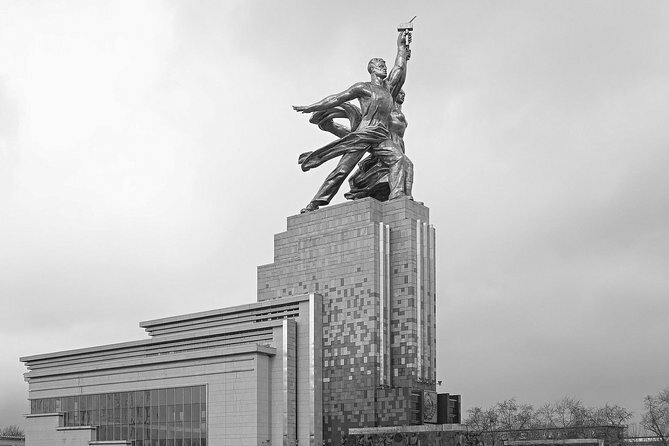 Until now, it remains one of the most typical Soviet constructions that impresses with its large size and grandiosity of the plan. Reconstructed in 2014, the enormous area of the recreational park VDNKH turns into the largest skating rink in the world in winter time. If you are not tired by the end of the tour, we will advise you to visit recently reopened The Cosmonautics Memorial Museum where you can learn a lot of interesting stuff about astronomy and space exploration.